This patient presented with excess fat around her mid section. She had larger flanks or "love handles". This may make it difficult for patients to fit clothes comfortably. Notice the dramatic liposuction before and after improvement in the patients shape. She now has a smooth curve to her hips which is now more in proportion to the rest of her figure. One popular reason for our patients to come in for a Liposuction procedure is so that they can look and feel more comfortable in their clothes; this is reflected in our liposuction before and after photos. The before and after photographs available on our website are meant to inform patients, so they should not be seen as definite results that could be obtained by you if you have the procedure. To get the most accurate view of what you could expect of this procedure, it is always best to speak to Dr Lanzer in person. Want more information about the procedure that was executed in this case study? Find out more about tumescent liposuction in the information overview below. A common area to perform Tumescent Liposuction on is the waist and stomach, where we commonly refer to problem areas such as “love handles”. This is an area that people can find is genetically inherited and often quite difficult to shift. Often diet and exercise will help, however optimum results may only be gained through performing Liposuction. Can I Get Liposuction to Lose Weight? 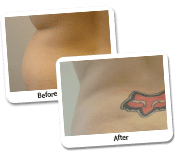 Liposuction is not designed for weight loss specifically. It is designed to sculpt and create a smoother shape, rather than reduce the weight on the scales. You will see from our liposuction before and after photos that when the fat is removed from the patient, it floats to the surface and any tumescent fluid removed will sit at the bottom, therefore indicating that the fat is lighter. It may be a reason why not all patients notice a difference in weight on the scales. The best results are achieved when the liposuction procedure is combined with regular physical activity and a healthy diet. We have an experienced, qualified dietitian at the clinic whose role is to help support our patients to achieve their best results. He is available to patients at no additional charge and will help you to develop a healthy lifestyle plan and support you along the way. Our dietitian will also measure you and organise the appropriate garment suitable for the particular areas you are having the Liposuction performed. These garments are to be worn for 2 weeks full time (of course can take off for showering) and then a further 2 weeks part-time, so either just during the day or only at night. Does the Dr Lanzer Clinic Meet All the Industry Standards for Tumescent Liposuction? We have a number of internal audits, which are done by our staff throughout the year to ensure we are complying with the requirements of standard 3. These audits look at areas including; hand washing, waste management, disposal of infectious waste, cleaning, sterilisation and linen handling, along with many more. These audits are reviewed by our Quality Manager and are addressed at staff and management meetings to ensure staff from all levels are aware of any issues or requirements for improvement. If it is found that any audit is non-compliant, implementations will be made as appropriate and the same audit repeated at a later date. Infection control is a very important aspect of our role as healthcare professionals here at Dr Lanzer’s Clinic, and we are dedicated in ensuring our practice is up to date with the latest requirements. 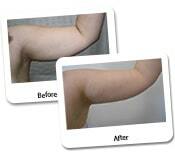 Why Does the Dr Lanzer Clinic Provide Pre- and Post-Operative Photographs? Patients have often heard of liposuction procedures, but they were never able to see the results that could be obtained from such a procedure; therefore, we provide prospective patients with access to our before and after pictures, which feature patients who had a liposuction procedure at the Dr Lanzer Clinic. Even though the results of your liposuction procedure will never be the same as those in the photographs featured on the website, since each patient is unique, it does give patients a realistic view of the possibilities of liposuction. If you are considering a liposuction procedure, we also recommend reading our liposuction information pages in addition to looking at the before and after photographs. Since liposuction is a surgical procedure, it is essential for patients to know how their procedure will be executed and what they can expect after their procedure. Even though this information is usually provided during your consultations at the Dr Lanzer Clinic, the additional information regarding liposuction procedures is available on our website so patients can refer to it when they have some extra time.